“Monasteries came into being even in the mountains and the desert was made a city by monks…” (Saint Athanasius, Life of Saint Antony). A declaration made many centuries ago about monks living in Egypt can echo through space and time, finding its way to the Antipodes, treading the soil of a small village known as Yellow Rock, where today a humble monastery has stood for half a century. The desire to withdraw from the urban life of a city into the tranquillity of solitude is not confined to the Christian tradition. But following in the footsteps of Christ, who was led by the Spirit into the wilderness for forty days, and luminaries such as Saint Antony the Great and Saint Pachomius, who established monasticism and asceticism in the sands of the Egyptian desert, Christianity has long since embraced the monastic life as the ultimate form of striving towards salvation. In fact, at the very heart of monasticism is a profoundly felt understanding of what it means to cultivate and keep the earth (Genesis 2:15). Monks know the significance of what it is to be liturgical creatures, to dwell in the church, not unlike a mother’s child in her womb. Like grapes on a vine, they do not move much at all, but the process of viticulture does everything, for they are attached to the life-giving vine that is none other than Christ. They experience a world that is filled with the light of the Resurrection, a universe filled with joy where all the trees of the forest rejoice. And because this is how they cultivate and keep the earth, their presence transfigures the very landscapes they inhabit. Yellow Rock is situated on the eastern, lower slopes of the Blue Mountains. Centuries ago, the Gundungurra people made the Blue Mountains their home, well before European settlement. The Indigenous people weave a story of the creation of the Blue Mountains where Dreamtime creatures Mirigan and Garangatch, half fish and half reptile, fought an epic battle that scarred the landscape into the Jamison Valley. One of the most famous landmarks in the Blue Mountains is the Three Sisters, the famous rock formation that watches over the Jamison Valley. An Aboriginal myth – or some argue, a colonial myth – tells of how three beautiful sisters were turned into stone by a witch doctor who wanted to protect them during an attack by a rival tribe. During the melee the witch doctor was killed, dashing any hope of their restoration. The Blue Mountains are replete with landscapes that manifest the earth’s motherly love. After all, Australia is far more than a natural landscape; it is a cultural, imaginary and even mystical landscape that has been experienced by its traditional owners, by those who colonised it and by the waves of migrants that shaped the country into an immigration nation. Its very name – ‘Blue Mountains’ – has it is origins in the blue tinge on the mountains when the range is viewed from a distance. A scientist would argue this is a natural phenomenon. A monk would see this as a glimpse of the mystery of creation. Many of the wondrous landscapes in the Blue Mountains remain without a trace of human civilisation. Others have been thoroughly urbanised. 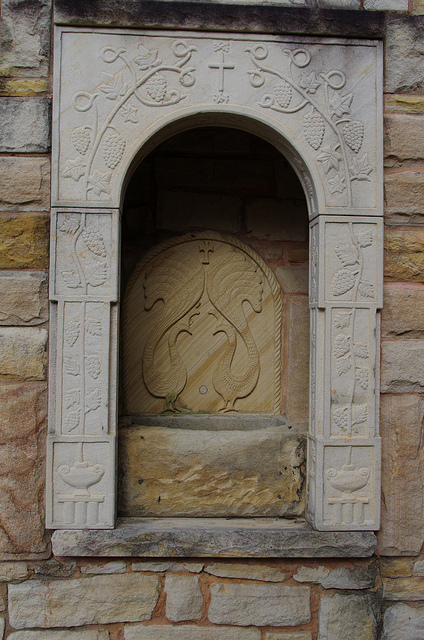 Some show the markings of its centuries old Indigenous people. And in the village of Yellow Rock, a monastery stands as a testament to how the Orthodox believe that the divine plays with everything in this world; renewing creation and making all things beautiful. 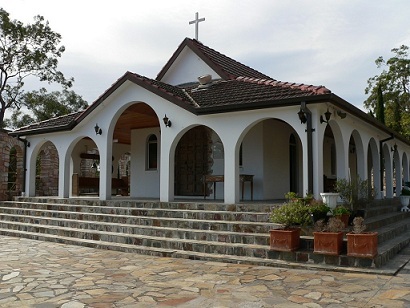 For fifty years now, the Holy Monastery of Saint George has been under the Greek Orthodox Archdiocese of Australia. 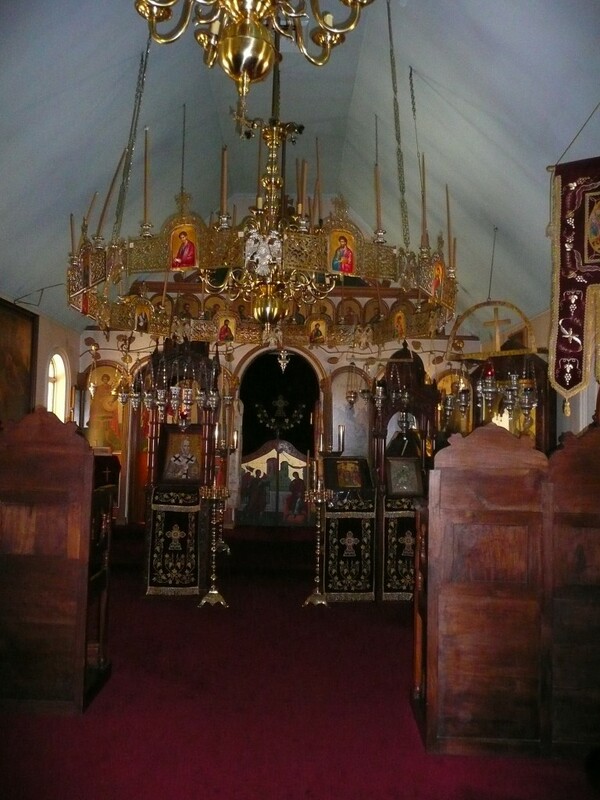 It is a place of great spiritual and cultural significance for all Orthodox Christians. How it came to be is nothing less than a tale of divine providence. 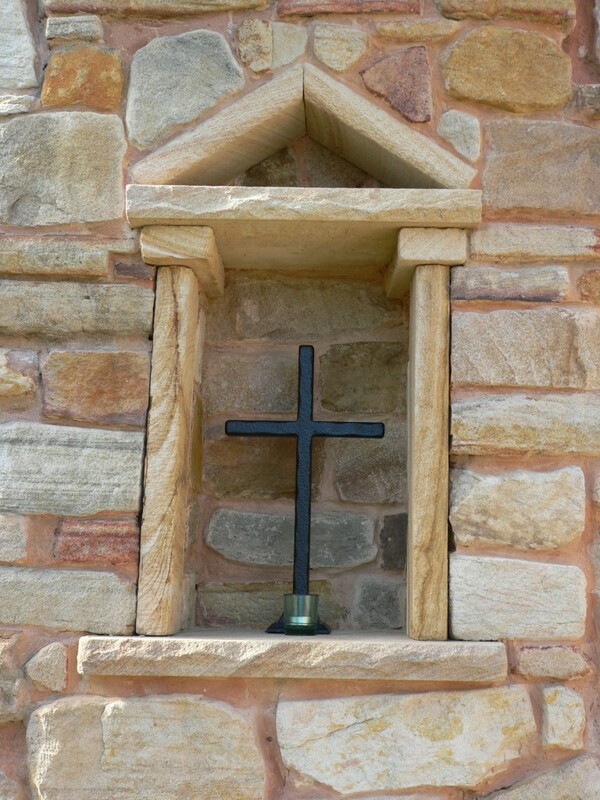 When the Greek couple, Eleni and Dimitrianos Frederikou, immigrated to Australia from England they decided in 1962 to purchase a property for the purposes of building a monastery. The purchase was provoked by dreams of the Mother of God, arid landscapes and eucalyptus trees, which Eleni Federikou began having while living in London and continued to experience in Sydney. After more than a few twists and turns that almost lead her to Hornsby, again the Mother of God came to Eleni in a dream to tell her that she was looking in the wrong place; the Virgin Mary was to be found elsewhere. Eventually she found herself in Yellow Rock where the monastery stands today, and immediately recognised it as the land that she had seen in her dreams. 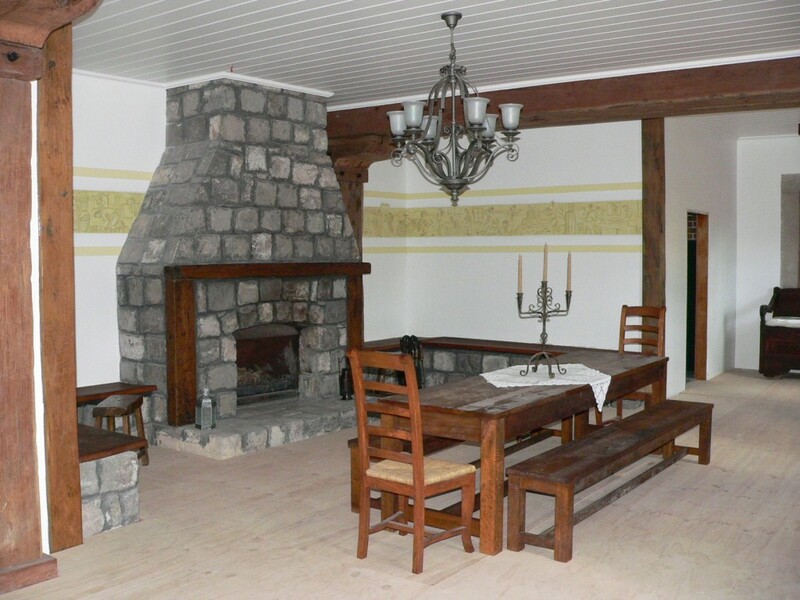 October the 4th 1962 is when it was purchased for 1600 pounds or thereabouts. The land was virgin land, completely untouched. The surrounding area and what is today Singles Ridge Road was for the most part a dirt track. There were only a few farms. In 1962, the then Archbishop Ezekiel and Fr Miltiades Chryssavgis celebrated the very first Divine Liturgy at the monastery. It was during the forty-day period after Pascha when the chanting of ‘Christ is risen…’ continues to reverberate throughout Orthodox churches worldwide. Of course, the church building at the monastery had not yet been constructed so the inaugural liturgy was an outdoor one. 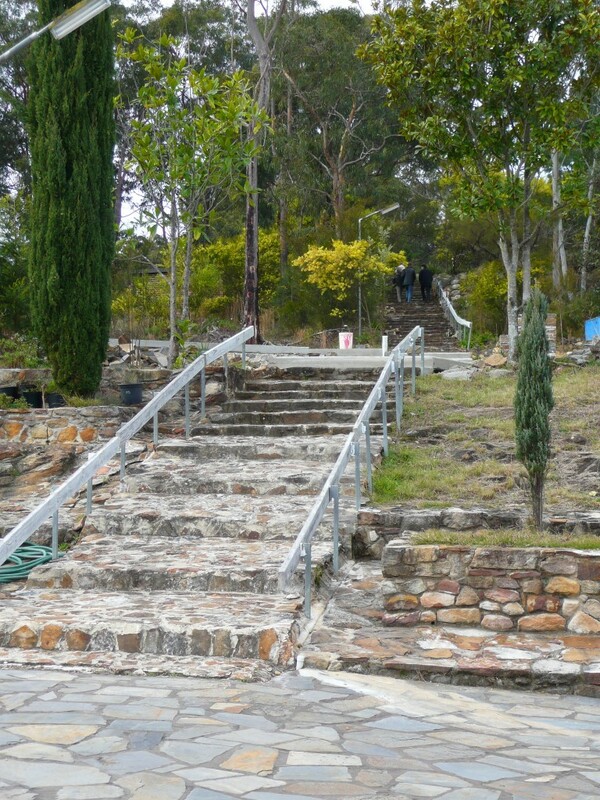 Nonetheless the backdrop of nature, the joyous paschal hymns and the many faithful who had made the pilgrimage to the Blue Mountains, filled the atmosphere with emotions of wonder and compunction. 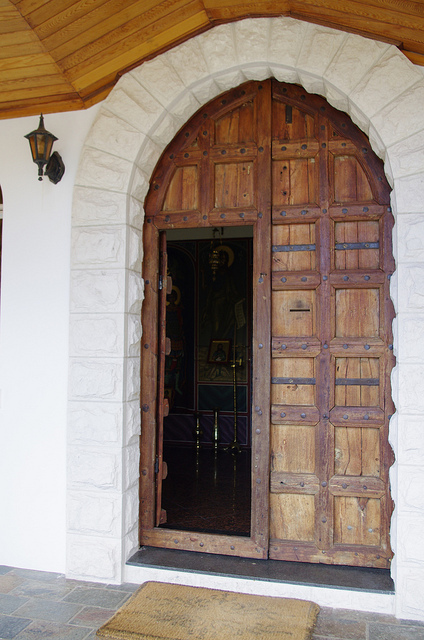 After the liturgy, His Eminence Archbishop Ezekiel turned to Fr Miltiades and told him of his desire to dedicate the monastery to Saint George. 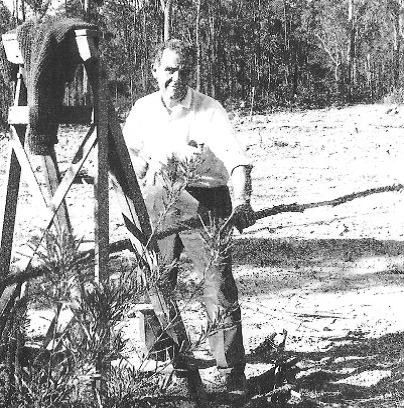 Thereafter, they were keen to explore the land of the monastery – land that was still wild and untamed – until they encountered the simple beauty of a creek that gave them cause to stop, rest and reflect on what were the humble beginnings of Australia’s oldest Greek Orthodox monastery. From its early stages when the katholikon (central church of a monastery) of Saint George and a simple house were the only forms of architecture on the grounds of the monastery, it has slowly flourished over time. 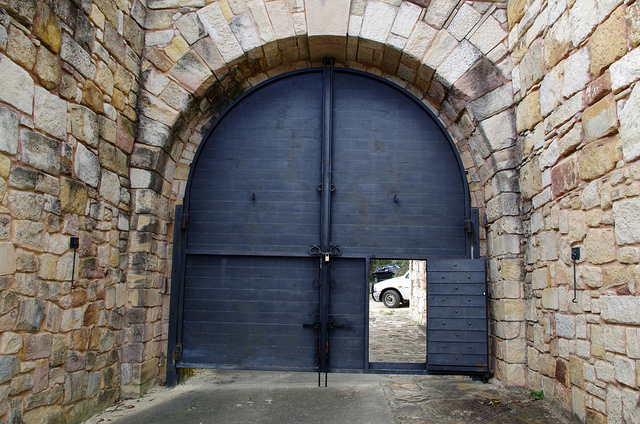 Today, once having passed through the main entrance and a coruscating mosaic of St George, the path leads down to a set of majestic doors nestled amongst a towering stone archway and winding walls built of incongruous rocks. 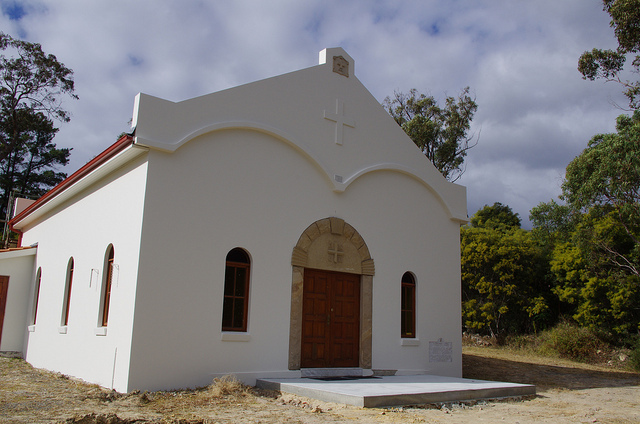 There is now a chapel dedicated to Saint John the Theologian and Saint Christodoulos of Patmos. The quarters that will serve as the archontarikion (the guesthouse) are almost complete. Still under construction are the library, the monks’ quarters, an administration building and the chapels of Saint Patapios and the Dormition of the Virgin Mary. 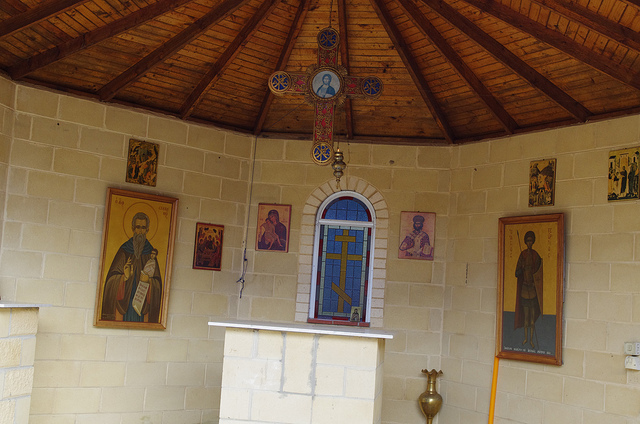 The latter will house the icon of Panagia of Yellow Rock and will serve as the cemetery chapel. 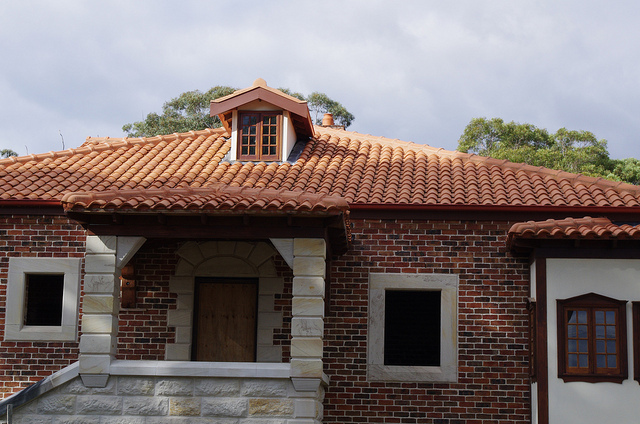 Many of the building works and projects undertaken by the Greek-Australian community at the Holy Monastery of Saint George would never have been realised if it were not for the encouragement and blessing of His Eminence Archbishop Stylianos. Indeed, His Eminence has had a special place in his heart for the monastery ever since he visited it a little before his enthronement in 1975. Desiring a day of rest and prayer in the tranquillity of the mountains, His Eminence travelled to the monastery accompanied by Fr Nicholas Tsouloukides and marvelled at the picturesque beauty of Yellow Rock and its surrounds. 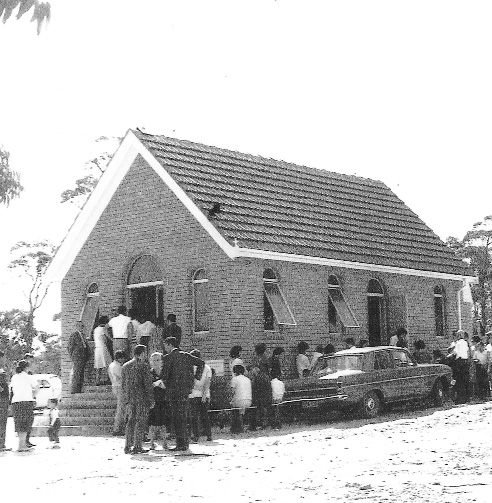 This was to be the first of many visits to the Blue Mountains, including one in 1976 when His Eminence Archbishop Stylianos made an official visit and was given a civic welcome by the Mayor. The local newspaper, the Blue Mountains Advertiser, declared with unabashed ebullience that it was the first time in more than 60 years that a Greek Orthodox Archbishop had graced the region with his presence. Various priests have served at the monastery over the past fifty years, including: Fr Constantine Christou for 18 years, Fr Victor Penel for five years, Fr Theoklytos Tsachourides for three years, and occasionally Fr Miltiades Chryssavgis. The present abbot of the monastery, Fr Kyriakos Stavronikitianos, arrived on the 8th of November 1997, the day the Orthodox celebrate the Synaxis of the Holy Archangels. In 2012, to coincide with its 50th anniversary celebrations, the Holy Monastery of Saint George in Yellow Rock commissioned the creation of the icon of ‘Panagia of Yellow Rock’ by the iconographer Peter Stefanovic. The initiative was made possible with the blessing of the primate of the Greek Orthodox Church in Australia, His Eminence Archbishop Stylianos. It is an unprecedented event for the world’s smallest continent and one that bears sacred significance. His Eminence Archbishop Stylianos also gave the blessing for the composition of a special service and supplicatory canon dedicated to Panagia of Yellow Rock, which were written by the hymnographer and Metropolitan of Rhodes, His Eminence Cyril Kogerakis. Today, with the blessing of His Eminence Archbishop Stylianos and the continuing support of the faithful, the journey has come full circle. The role played by the Virgin Mary in making the monastery a reality has engendered another holy icon of Panagia; a landmark event for Australia. The Most Holy Theotokos with her reply to the Archangel Gabriel – “Behold the maidservant of the Lord” – became a fellow worker with God in the mystery of salvation (Elder Tychon of Stavronikita). In the profound words of St Gregory Palamas, the Theotokos is “the cause of all those who have gone before her, and the guardian of all those who come after her”. His Eminence Archbishop Stylianos has interpreted this striking phrase in the context of the deification of the human person, which was the pre-eternal will of God, seeing that even after her Dormition, the Mother of God remains close to us through her ceaseless intercessions (The Mystery of the Virgin Mary). 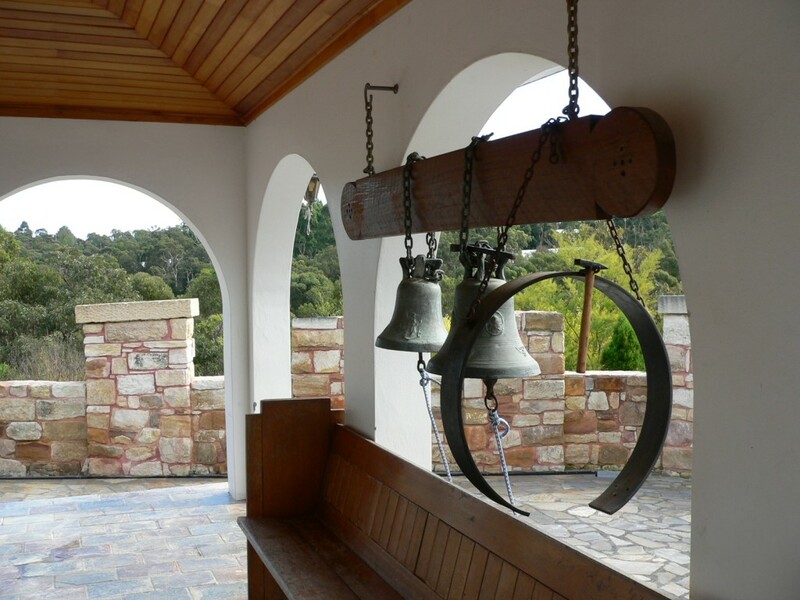 Panagia of Yellow Rock is now in the midst of the Orthodox faithful in the Antipodes in a very intimate way. This did not happen by chance. Nor was she ever absent. She has never ceased and does not cease being the one who leads to heaven those who are here on the earth. But inasmuch as the salvation of humanity is actively experienced as a restoration of the ancient beauty bestowed upon it by its Creator, the Mother of God has made it possible for the whole of human nature to experience divine beauty and even give birth to it by grace. 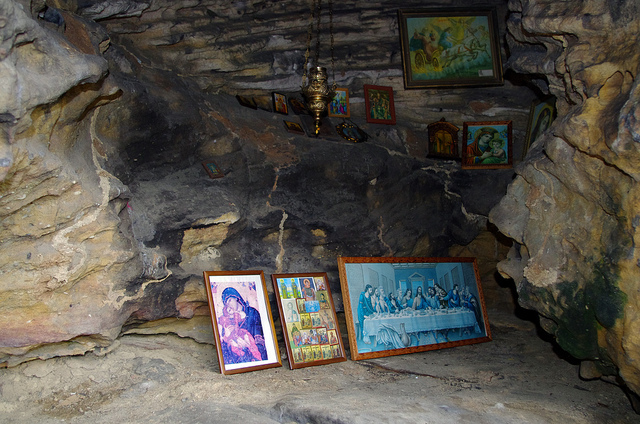 The icon of Panagia of Yellow Rock was slowly hewn from the prayers, works and dreams of the Orthodox who heard the call of the good, the true and the beautiful, and yearned to partake in it. In a world still reeling from the project of modernity, filled with impersonal institutions, economies of agglomeration and the inexorable rise of technology, Christianity has not forgotten the desert, the valleys and the mountains, which groan and eagerly await the transformation of creation into a place of divine dominion by those who understand what it means to cultivate and keep the earth. Where some people saw untamed mountains and forbidding landscapes, others who love Christ saw a place that manifests divine beauty. After half a century, the untilled land of a monastery in Yellow Rock has been shown forth as a city of the new creation that has been filled with divine light. It is a witness to the world of the significance of the world, which has immense value because it is a manifestation of God’s love. And it is a living testament of Christianity’s essence, of the destiny of humankind; to become sons and daughters of God by adoption, living a life in Christ and experiencing the uncreated light that knows no evening.